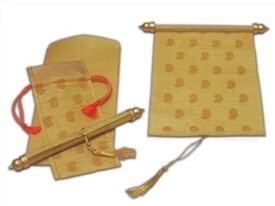 Description: When form meets function, fantasies take the shape of reality. 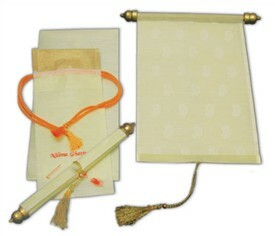 This innovatively designed and really pretty wooly paper scroll card is one such fantasy. 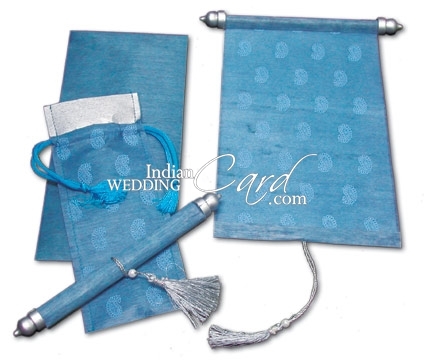 The navy blue color wooly paper scroll card has lighter blue paisley design prints in the overall fashion. 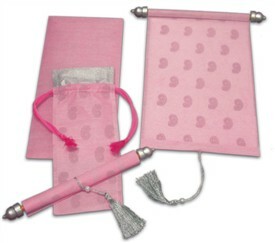 A silver bar at the top provides the base and the stylized silver tassel at the bottom is for the tying purpose. 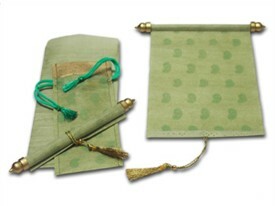 A superbly designed traditional potli in the same paper with similar paisley prints with a glittering silver strip on the top and a blue tassel ties it. 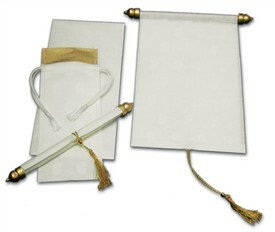 The plain envelope is in similar paper. 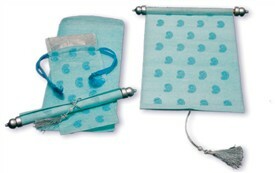 Paper: Scroll, Pouch and mailing envelope on Dark Blue Wooly paper, with plastic bars & silver ends and matching tassel.